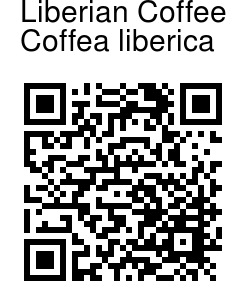 Liberian Coffee is a species of coffee that originated in Liberia, West Africa. The coffee tree grows up to 9 m in height, producing cherries that are larger than the cherries found on Arabica trees. 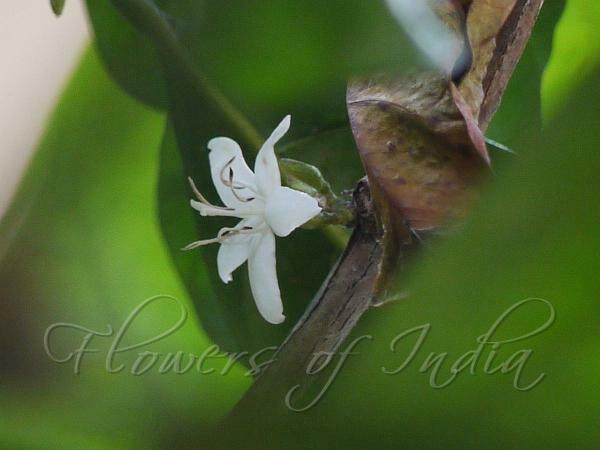 It is an evergreen shrub or tree that has dimorphic branching and large leathery leaves. Leaf blades are about 14-25 x 5-9 cm, carried on stalks about 1-2.5 cm long. They are thinly leathery to stiffly papery, elliptic to obovate or obovate- elliptic. The large flowers are self sterile and open at irregular interval, rather than in flushes as in the other two cultivated species. Flowers borne in almost sessile clusters in the leaf axils. Flowers are about 3-4 cm across. Sepals are small and inconspicuous. Flower tube is about 1-1.2 cm long, petals 7-8, about 6 mm long, hairless. Stamens are about 7-8. Fruits are round, about 1.8-3 cm long. Seeds two or three per fruit, each seed enclosed in a hard endocarp about 13-15 x 4-8 mm. Photographed at Kodagu Valley Resort, Madikeri, Karnataka.